Humble Bee polycotton beekeeping smocks are constructed from a premium 50% cotton / 50% synthetic blend. We raised the bar on quality by double-stitching the pockets and including a deluxe canvas carrying case. We also added an elastic waistband for comfort, elastic wrists to protect your limbs, plus thumb holds to keep the smock perfectly in place. 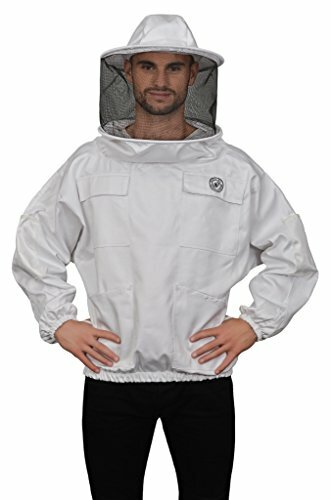 Humble Bee polycotton beekeeping smocks utilize medium-weight (280 gsm) cloth, woven in a special interlocking pattern, that provides superior protection against bee stings. At the same time, the lithe, breathable fabric helps keep you cool during the warm summer beekeeping season. With Humble Bee, say goodbye to painful bee stings and hello to extra strength protection and all-day comfort! Humble Bee polycotton beekeeping smocks come in a variety of sizes - just like beekeepers do! Simply review our sizing chart in the product images to find the beekeeping smock that fits you best. If you have any questions about this product by Humble Bee, contact us by completing and submitting the form below. If you are looking for a specif part number, please include it with your message.